These are lyrics by Warren Zevon that we think are kind of funny. 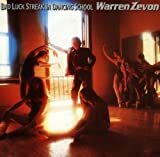 Warren Zevon's, "Play It All Night Long"
Warren Zevon's, "Werewolves Of London"
You better stay away from him, he'll rip your lungs out, Jim. The werewolf is tearing at his friend, and all Warren cares about is the beast's taste in clothes. Even though this is not "ha-ha" funny, I put it here because it seemed most appropriate for this section.